It’s very frustrating to spend hours refining a writing piece only to check your analytics after it’s been published and see that visitors are merely giving it a quick glance before leaving. While taking things personally is always a very productive strategy (I don’t care what my therapist says), as a website owner or online marketer there might be better ways to deal with this particular phenomenon. Therefore, in the name of your personal sanity (and mine), let’s take a look at ways to keep visitors on your website longer and minimize your bounce rate. Don’t we all want that extraordinary, original design that nobody else has so that our site can be as unique as a snowflake? Your web design first and foremost has to serve a purpose: To present your content in the best possible way so readers won’t be turned off and will continue reading it. How do we achieve that? I’m glad you asked. If your website overloads your readers’ visual nerves, they are unlikely to stick around. A plain background in a light color lets your content breathe and shine. When you look around the web, you will see that many of the most successful blogs refrain from doing anything fancy with their background color. From Quick Sprout, to I Will Teach You To Be Rich, to Social Triggers, to The Art of Non-Conformity—white backgrounds is all you see in their content area. However, background-color: #fff; is not a cure-all for all bounce-rate woes. Changing the backdrop alone won’t do much good if the rest of your content looks like a group of clowns inside a car. With that in mind, it might be a good idea to crank up the margins and paddings around your content. One of my favorite examples for this is the Genesis Framework. It looks clean, uncluttered and is a real feast for the eyes (yes, I’m a fan and a customer). In the same vein, creating space inside your content is just as important as making room around it, all in the name of legibility, of course. Your tools for that: Font size and line height. The WordPress editor is a great example of great spacing between lines, making the text very pleasant to read. Its developers also didn’t skimp on the font size: A full 16px ensure that even a mole could decipher it. This number is also the minimum size Smashing Magazine recommends for body copy. Last but not least, the font you are using also influences how legible your content is. I know, I know, with Google Fonts and other free typekits out there, it’s easy to get carried away in terms of typography on your website. However, keep in mind that the first goal is always to enable people to read what you put out there. So go for simple, not fancy. The aforementioned Social Triggers’ blog actually has an excellent article on this topic (including studies!). Of course, you already know that great content is key to keep visitors on your website (or getting them to your site in the first place). But how about we go from cookie cutter advice to actionable strategies? Yeah, I thought so, too. To figure out where to start optimizing, you first need to know what is already working on your site and what is not. For that, it’s always a good idea to study your analytics which you have hopefully installed on your site. 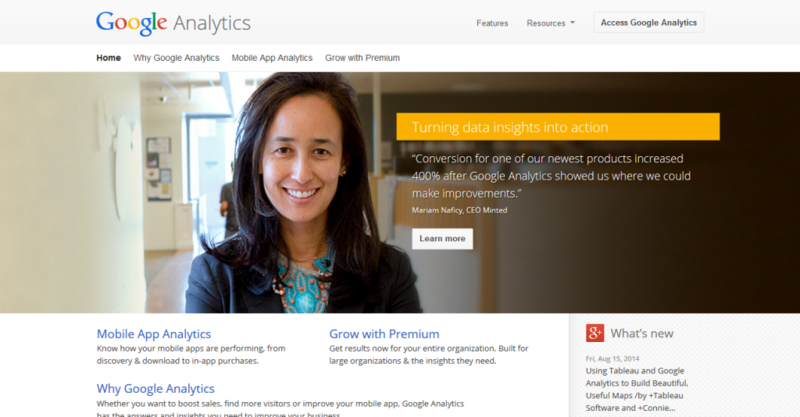 There are many options for implementing analytics in WordPress, but most of us go with Google’s solution. If you haven’t done so yet, the Google Analytics plugin by Yoast is a great option. Under Behavior > Site Content > All Pages you can see a rundown of your content and its different stats. Check where your visitors spend the most and the least time and which posts and pages have the highest and lowest bounce. This knowledge is crucial in order to make targeted improvements to your website. Pay special attention to content which gets a lot of pageviews but doesn’t retain visitors for very long. If you already have the visitors but can’t keep them, maybe there are some measures you can take to address this weak spot. It’s also important to notice which content is favored by your audience. By getting to know the likes and dislikes of the people frequenting your website, you can produce more of what they love and get them to stick around longer. When you do start creating new content, keep the following in mind. Make something people want. . . There’s nothing more valuable than an unmet need that is just becoming fixable. If you find something broken that you can fix for a lot of people, you’ve found a gold mine. The first goal of your content should always be to help others. If you can enable other people to improve their lives, career, business, health, or other things that truly matter to them, they will gladly spend time on your web presence. I seem to mention this in every second article these days, but it bears repeating: Long-form content outperforms shorter articles every time. To learn more about this, check this article on serpIQ and what the good people on Moz have written on the same topic. Headlines are arguably the most important piece of copy inside your content. They are the gatekeepers which decide whether or not someone will click through to your site. Therefore, getting schooled in the creation of headlines is an essential step for marketers, bloggers, and website owners. In a recent article on content hacks, I broke down the topic of headlines further including some invaluable resources. I would recommend you check it out. Humans are very visual. You can write the most insightful article the world has ever seen, something that will instantly transform the life of anyone who reads it, however, if it’s displayed in one unstructured block of text, not many people will. The hard truth is that a lot of people will won’t read most of your content anyway, even if they are interested! With the overabundance of material online, we have become a species of scanners. Therefore, it is important that you adapt to this reality, by making your content scannable. Using paragraphs, headlines, and subheadings provides a structure and enables readers to only get into the parts that they are actually interested in. Hey, having someone read parts of your content is better than nothing, am I right? Also, even though posting content on the Internet is essentially a one-way street, it doesn’t have to feel like one. Have you noticed how I ask questions throughout the article? How I try to show off some of my very pleasant (and humble) personality? That’s just for you, silly! So you don’t get bored to tears reading through my stuff! To keep your readers engaged and on your site, refrain from sounding like a boring college essay. Yes, your audience wants to be informed, but they also want to be entertained. Talk to them like you would to your friends or like you are in the same room together. Sure, it won’t always be grammatically correct, but it will definitely be a lot more pleasant to read. Plus, it’s also much more fun to write! Another thing that can seriously spice up any text: Less text. Sure, especially if you are running a blog, the written word will be your main means of communication and rightly so. You readers will thank you! Now that your content gets the attention it deserves, it’s time to make sure your readers come back for more. As a website owner or marketer, you should be building an email list no matter what. However, this is doubly important for your on-site time. People who sign up to your email list are already interested in your content. I mean, they have given you direct access to their inbox. That’s a serious sign of trust! As a consequence, you are doing them a service letting them know about new stuff on your site, as they are more likely to come check it out and read it in its entirety. One good option to collect email addresses is the List Builder app by SumoMe but there are many more such as OptinMonster and Bounce Exchange. Also, my favorite service for newsletter management is MailChimp (in case you care). This goes hand in hand with both the “Be of service” and the “Start a conversation” credo from earlier. If people comment on your posts or even email directly with questions and inquiries, the worst you can do is ignore them. If you really care about the needs of your audience and build a reputation as a problem solver, you can’t help but build a loyal fan base that will eat up your content and keep coming back for more. This is sort of a no-brainer, but it’s worth repeating: If you have other valuable stuff on your site, let your readers know about it! Link to other posts (where it makes sense) and refer to other stuff you have written. The genius thing about this is that WordPress makes linking internally incredibly easy. 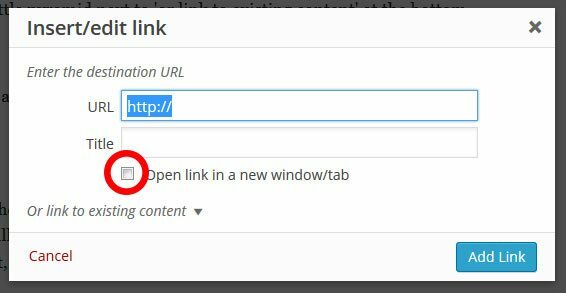 Just mark the text you want to add a link to, click on ‘insert/edit link’ (or Ctrl/Cmd+k for a shortcut) and then on the triangle at the bottom where it says ‘link to other content’. Scroll down the list of existing content on your site or type in a search query. 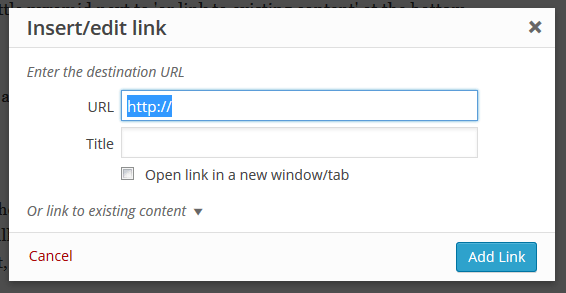 Upon click on one of the titles, WordPress will automatically populate both the link and title section. Click on ‘Add Link’ and you are done. While we are talking about linking: Of course, where it makes sense, you should always refer to other articles that underline your points, especially if they reside on high-quality websites. That way your visitors can look at whatever you recommended in the article, but do not automatically leave your site in doing so. Pretty smart, huh? Another way of letting your readers know about other interesting stuff on your site is to use a plugin. 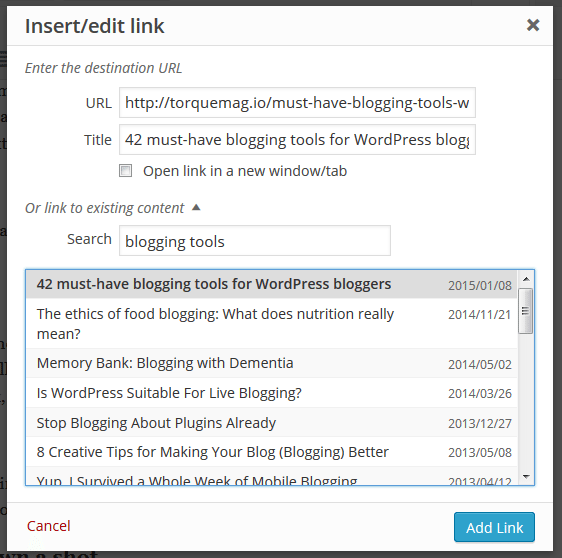 Related posts plugins automatically show content pieces that go well with what your visitors are already reading. A community favorite is YARPP, which stands for ‘Yet Another Related Posts Plugin.’ However, some say that YARPP and similar plugins are heavy on the database and thereby increase page loading time. I’m not qualified to judge this, however, if you find that that is the case for you, Jetpack offers a related posts module that outsources the heavy lifting to the WordPress.com servers, which might be worth a try. Talking about showing off your other awesome content: I hope there is some place on your blog or website where you are displaying your most popular posts and pages? No? Well, how are your readers supposed to know about them and click through? Exactly! And don’t even give me that excuse about not knowing which plugin to use, I have a whole list for you right here. If you are anything like me, you don’t pay much attention to the search field found on almost every website. However, that doesn’t mean everybody is like us. Some readers will actually see if they can find more stuff they are interested in through a site search and stick around if they do. When you implement internal search (which is easy since it’s one of the WordPress standard widgets), you can even look at the queries they use on your website and get a better understanding of your audience. Find out how in my article on key marketing metrics. Team Yoast is not only well known in the WordPress community for their SEO plugin, they have a couple more things up their sleeves. One of those is the Comment Redirect plugin. What it does is reroute first-time commenters on your blog or website to a page of your choosing. This can be an archive page with your top-of-the-line content or a thank you page where you ask them to like your Facebook profile or sign up to your newsletter. Not only does this keep them on your website, if done right, it makes a great first impression. Lisa Barone at Outspoken Media wrote about the massive success they had with this approach here. Ok, so far so good for the front-end optimization. Now let’s take a quick peak at what you can do under the hood of your site to increase your chances of people sticking around. It’s no secret that the ubiquity of mobile devices has led to a sharp increase in online traffic from tablets, phones, phablets, and everything in between. It has gotten to the point ze Google not only introduced a ‘mobile-friendly’ tag in its search results, but also stated that mobile capability is now part of their ranking algorithm. For us website owners that means if we want to keep the people around who use their iPad or Android phone to surf the Internet (or even attract them in the first place), we better make sure our sites look good on their devices. There are different ways to achieve this. Either you go with a responsive theme (which is one of the continuing web design trends in 2015) or use a plugin to make your website mobile-friendly. The surest way to crank up your bounce rate is to have visitors land on a page that doesn’t exist, and read ‘404 – not found.’ Being confronted with the most unwelcome site on the Internet, they might leave and never come back. So, one thing you can do is create a custom 404 error page that keeps users engaged instead of repelling them. Google Webmaster Tools–Broken links are listed under ‘Crawl Errors’ . A slow-loading site is one of the easiest way to bleed visitors. So much that, 75% of users would not revisit a website that takes longer than 4 seconds to load. How’s that for some 80/20 of keeping visitors on your site? There are many steps you can take to reduce loading time, from image compression over working with a premium host to content delivery networks. Read this awesome article by Jonathan John on how to make your WordPress website lightning fast. Keeping visitors on your website and reducing the bounce rate is one of the most important things for bloggers and website owners alike. Engaged visitors are more likely to purchase your product, sign up for you services, or tell others about your awesome content. 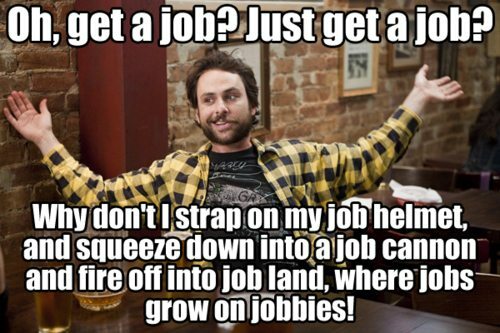 Luckily there are plenty of things you can do to make this much more likely. From analyzing your web data, to content optimization and measures to showcase it in the best way possible, all the way over to technical improvements, the list of tools is not a short one. What measures do you take to keep people on your site? Have you slashed your bounce rate in half or some such feat? Stay a while and let us know.